Ice cream is good for you. Its base ingredient is milk, which is loaded with healthy vitamins and minerals. Americans consume an average 48 pints of ice cream per person, per year. It takes about 50 licks to finish one scoop of ice cream. In 1984, Ronald Reagan designated July as National Ice Cream Month and the third Sunday in July as National Ice Cream Day. An average dairy cow can produce enough milk in her lifetime to make a little over 9,000 gallons of ice cream. 90% of the nation’s population consumes ice cream. California produces the most ice cream in the U.S. The U.S. produces the most ice cream in the world. Records kept by a Chatham Street, New York, merchant show that President George Washington spent approximately $200 for ice cream during the summer of 1790. Hawaii has a fruit known as the ice cream bean or the monkey tamarind that actually tastes like vanilla ice cream! One of the most important ingredients in ice cream is air. Without it, ice cream would be as hard as a rock. Regular ice cream has at least 10% milk fat, premium ice cream has 12% and super premium ice cream has 16%. Franklin Roosevelt served ice cream to King George. There is actually an ice cream diet designed for weight loss. According to Guinness World Records, the largest ice cream pyramid was made in August of 2002; made up of 22 layers, 3,894 scoops and weighed 1,005 pounds. It was made by Carvel. 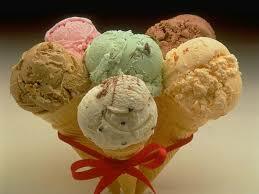 Ice cream became available to the general population in France in 1660. Ice cream was introduced to America in the 1700's, but mostly enjoyed by those of status and wealth. Americans celebrated the victory of WWII with ice cream. In 1946, they ate more than 20 quarts of ice cream per person. According to Guinness World Records, the largest ice cream cone (as of January 2011) was over 9 feet tall. It was achieved at an event in Italy.